This plugin provides a new link on the showthread-page close to the "View a Printable Version" block. With this link the according thread will be marked as "hidden". Those threads will not be shown in search-results or "new posts" and "todays posts". 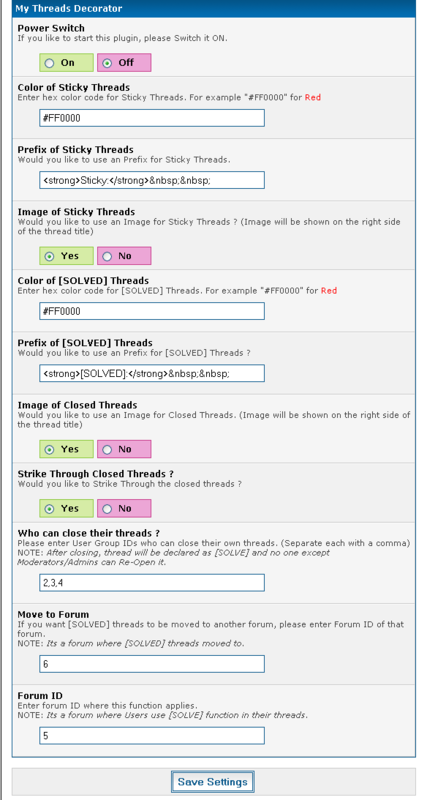 The list of hidden threads can be viewed and edited in the User-CP. A hidden thread can be marked as visible as well via the thread itself at the bottom of the showthread-page. The plugin needs a modification of the search.php (explained in the readme-file) which will not be done by the plugin itself. However, the plugin includes a xml-file which can be used instead if frostschutz' Patches-Plugin is installed, so you don't need to do the code changes by yourself. The plugin is based on Starpaul20 "Favorite Threads" plugin. Thank you Starpaul20, for your approval to use some of your PHP-code. Mit dem Plugin könnt Ihr Themen über einen Link am Ende der Themenanzeige in eine Liste von ausgeblendeten Themen (erreichbar über das Benutzer-CP) speichern und dafür sorgen, dass diese Themen in Suchergebnissen nicht mehr aufgeführt werden. Die Liste kann über das Benutzer-CP eingesehen und bearbeitet werden. Ebenso können entsprechend markierte Themen auch am Ende der jeweiligen Themenanzeige wieder aus der Liste entfernt werden. 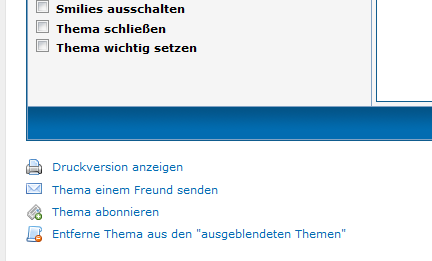 Dem Plugin liegen die Sprachpakete für deutsch_du, deutsch_sie und english bei. Das Plugin erfordert eine manuelle Anpassung der search.php Datei. Wer dies nicht möchte und das Patches-Plugin von frostschutz installiert hat, kann auch die notwendigen Änderungen mittels der beigelegten xml-Datei importieren. Das Plugin basiert auf dem Plugin "Favorite Threads" von Starpaul20. Vielen Dank an ihn, einen großen Teil seines Codes für mein Plugin verwenden zu dürfen! Manage your Closed & Sticky threads with this plugin. Change Color, add an Image, add an Prefix and Strike through Closed & Sticky threads. Closed threads will be move to another selected forum automatically. Hide object inside the spoiler tag. This plugins automatically creates a new thread in a specified forum whenever a new event was created in one of the specified calendars.